Since I am always writing about the fun things we've done and what a perfectly amazing time we've had at XYZ place, I think I'm long overdue for a "get real" post. The truth is, not all our outings or travel experiences go as planned and some are downright failures. Any family traveler will probably tell you the same. A few things have reminded me of that lately, and I thought I'd share how we made the best of it. It was Good Friday, and school was in session but my husband had a rare weekday off. Off we headed for Wonderlab, a children's science lab in nearby Bloomington, Indiana. I've heard great things about Wonderlab and was excited to visit. Plus, Bloomington itself is a great college town (home of Indiana University), and I wanted to go someplace hip and cool for lunch. As we pulled out of the gas station a few miles from home, we instantly knew something was wrong. I had run over a razor at the gas station and my tire was completely shredded. This turned into a 2-hour process of trying to change it ourselves and eventually crying uncle and calling a tow truck. All in the pouring rain. The bright side? We managed to pull the car into the parking lot of a big hotel here in town, and the arrow spent the entire time running around the lobby, indoor pool, banquet center and arcade. (Many, many thanks to the Holiday Inn here in Columbus for their very kind hospitality that day!) He kept calling the hotel a museum because he thought it was just our planned adventure for the day (ah, the innocence of two-year-olds!) While we waited on the tow truck, we treated ourselves to the fancy hotel breakfast (muddy clothes and all) and laughed about our fate. And, now I have material for a post on "What To Do When You Get a Flat Tire." As my husband said, only a blogger whips out the camera when the tire goes flat. 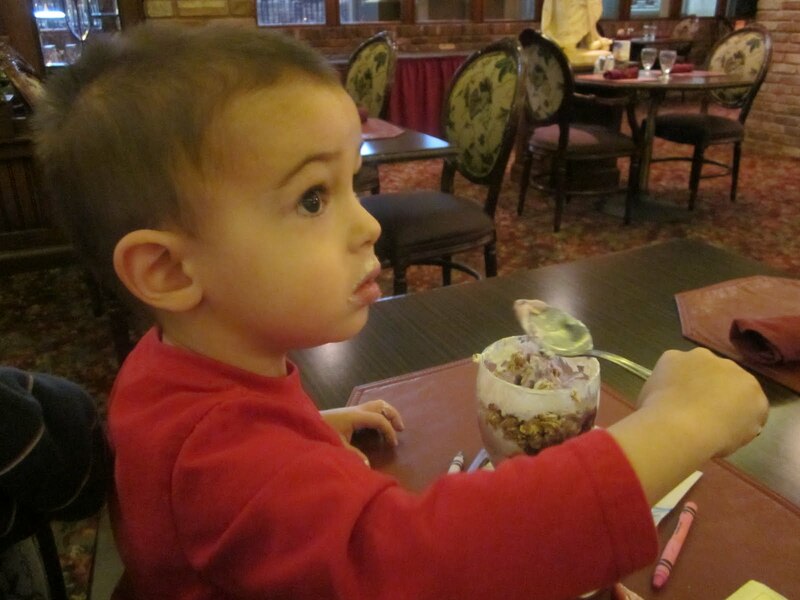 Eating the fancy yogurt parfait at the Holiday Inn. A few weeks ago we had planned a fun camping trip at Spring Mill State Park in southern Indiana. We've never been to this state park and it has so much to offer. Alas, first trimester misery intervened, and we canceled our plans. The bright side? We got a lot of long overdue yard work done at home that weekend. Which has freed us up to have more guilt-free fun on subsequent weekends now that I'm feeling better. And our neighbors probably appreciated the improved curb appeal. Plus, if you have to cancel a vacation due to illness, pregnancy is a good cause. 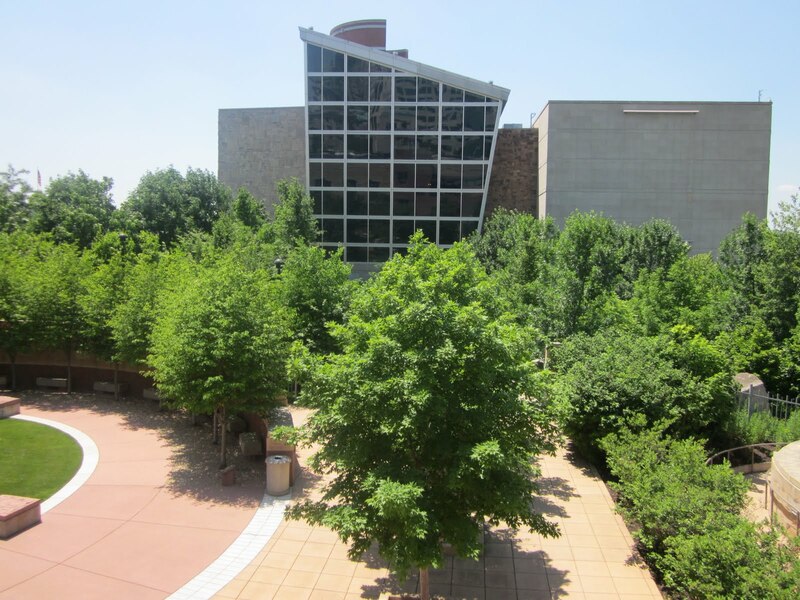 This past week, I had planned to spend two days touring White River State Park, a really unique urban park in the heart of downtown Indianapolis. While I've visited some of the attractions in the past, on this trip we would be participating in museum tours led by staff, new experiences like a Segway ride, and a night in the swanky new J.W. Marriott hotel, which borders the park. Sounds great, right? It certainly was, until the arrow got very sick very quickly back at his grandparents' house. I literally ran out of Victory Field during the start of an Indianapolis Indians game to get to him as quickly as I could. He's fine now, but was pretty sick for about 24 hours and I missed most of the trip. The bright side? I wasn't very far from my parents' house and was able to get to my little guy in a matter of minutes. Also, I did get to participate for most of the first day of the tour, so I have plenty of material to write about and share with you. Like the amazing garden they've planted at White River State Park, which I'll post about on Wednesday. So stay tuned. And the best part of all? All these wonderful locations are an hour or two from home. Meaning they can remain on my to-see list for 2011. What travel hiccups have you experienced? How did you find the bright side? This post is a part of Mondays are for Dreaming at the Mother of All Trips. I'm dreaming of a rescheduled visit to Wonderlab, a weekend under the stars at Spring Mill State Park, and a Segway ride around White River State Park! Oh.. I know what you mean. Behind all the fun posts there are many other mishap posts ready for me to blog about. I'm glad you can find the bright side from the story. Sometimes I think we have more hiccups than successes. At least they make good blog stories, right? And like the Arrow, he was always perfectly happy there! Just goes to show that the stress is usually all on the grownup side (at least when they are really young).